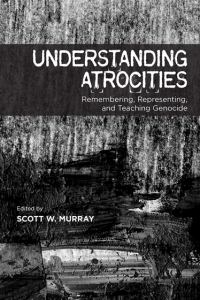 Understanding Atrocities is an edited volume that grew out of an interdisciplinary conference featuring academic research in genocide studies alongside the work of secondary educators and community organizations. The work fits within the broad mandate for genocide education summarized by the volume’s editor, Scott Murray, in his introduction: “One challenge we face today, therefore, is to find ways of making this immense, complex, ever-expanding body of scholarship accessible to non-academic audiences.” From chapters on proto-genocide in Sri Lanka (Christopher Powell and Amarnath Amarasingam) to new work examining theatrical representations of mass violence (Donia Mounsef), Understanding Atrocities explores examples and aspects of both the familiar and hidden genocides and atrocities of the twentieth and twenty-first centuries. Of particular interest for educators, and those scholars working on issues within genocide education, are chapters on the benefits and challenges of such education, specifically one examining the Armenian genocide (Raffi Sarkissian), as well as a chapter on developing an undergraduate course around representations of war and genocide in children’s literature (Sarah Minslow). Both chapters highlight the need and possibilities to expand genocide education beyond its traditional boundaries. Minslow thoughtfully weaves discussions of rationale, content, and pedagogy while describing a course on war and genocide in children’s literature. Although specifically addressing experiences in teaching an undergraduate-level course, Minslow’s chapter provides valuable insights derived from her own experience, which would prove equally applicable to K-12 teachers. The chapter adds to the growing body of work on teaching genocide via young adult literature, charging that children’s literature can and should take up themes of violence and genocide. Sarkissian’s chapter, which begins with some of the tensions that emerged as the Toronto public schools expanded their secondary curriculum to include the Armenian genocide, touches on important discussions of representation and denial, as well as the overall benefits of studying genocides comparatively. Additional chapters discuss a 1951 petition charging the United States of genocide against African Americans (Steven Lennard Jacobs) and an exploration of the legacy of settler colonialism through an examination of media coverage of the housing crisis among First Nations in northern Ontario (Travis Hay, Kristin Burnett, and Lori Chambers). These chapters offer poignant reminders of the social and structural white supremacy in the United States and Canada, both historically and presently. While both nations have dealt with their similar pasts in increasingly divergent ways, the two case studies highlight the shared difficulties of coming to terms with past atrocities and their legacies. These contributions also trouble the notion of striving for social change without first acknowledging and addressing past and present injustices. Despite what might at first glance appear to be a disparate collection of topics and approaches, it is precisely the range of topics that make this work a welcome addition to the field. Understanding Atrocities is a highly approachable work, especially for anyone interested in expanding their knowledge of genocide and mass violence. The book is also freely available for download from the publisher’s website, making the work doubly accessible for non-academic audiences. Understanding Atrocities is available for free download from the publisher’s website.